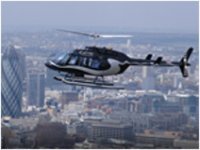 Product review: Helecopter flight – by Simon, 17 Oct 14 4/5 Good "I found the arrangements quite straight forward, the staff at the airport were very friendly and helpful. It was very easy to get to the airport, the facilities were good. The staff and equipment were good, and I felt confident about the flight. The briefing was good and my son felt safe and knew what to expect. The experience was good. The only thing negative to say was that the flight instructor spent too much time showing off his skills and not enough time showing my son the ropes. The flight didn't run over by even a minute! After the event we had time to take photos. " A fantastic 30 minutes trail lesson in a Robinson R22 above the stunning sites of the Kent country side. This is a perfect gift for friends and family or if you are up for a challenge, why not try it yourself. Our trial lessons and tailored 'taster' courses all give accountable flying towards the issue of your licence, if you later decide to continue towards your PPL (H). Friends and family are welcome to come along to the airfield to wave you off and cameras are encouraged. There is currently 1 review of this experience. Write a review. I found the arrangements quite straight forward, the staff at the airport were very friendly and helpful. It was very easy to get to the airport, the facilities were good. The staff and equipment were good, and I felt confident about the flight. The briefing was good and my son felt safe and knew what to expect. The experience was good. The only thing negative to say was that the flight instructor spent too much time showing off his skills and not enough time showing my son the ropes. The flight didn't run over by even a minute! After the event we had time to take photos.